Our Mind is subtle, thoughts are subtle, Prana or life force energy is subtle……We perform various activities in our life as a duty, ritual, out of fear, guilt, out of habit, monotonous, or routine without our giving much thought as to why are we doing it. At least once in our life time we would have asked ourselves this question – why and what is the reason for performing such activities?When we start paying little attention, then we are in our journey towards making the Subtle Connection. 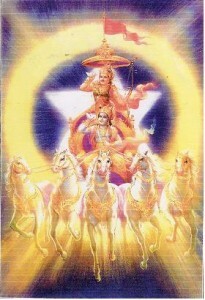 Lord Krishna being the Supreme Soul is guiding the Jiva (individual self – Arjuna) by being the charioteer (Chariot is compared to the body) to march on the right path – If the reins (mind) are let loose, the horses would run wild; this would result in catastrophe. But Lord Krishna is in total control of the reins which is controlling the horses to run on the specified path – unwavering in total self-control. Horses represent the five senses – sight, smell, touch, taste and hearing. When we allow the senses to wander, the body suffers; when the senses are controlled and the mind is focused, the soul awakens and guides us to right action. In other words: When sense enjoyments take control over mind, the mind is always wavering, ever caught up in the whirlpool of emotions – choosing a pleasant life. An awakened Soul guides the mind to attain stability. Stable mind turned in wards towards the self, leads to intellectual clarity (Buddhi withdrawn from the “I” ego principle) guides the senses from wandering, helping one distinguish between Good and Pleasant. Mind, body and soul are in union. One reaches the state of eternal joy, happiness and bliss. Here “Good” is associated with permanent happiness, bliss and ever lasting joy. “Pleasant” is associated with mind being slave to the senses. Under such conditions the Mind experiences mostly pain, sorrow misery and choosing only momentary or temporary happiness. We would have, in fact, read the meaning behind this picturesque scene through different sources. Have we ever experienced this inner meaning? This is the beauty of our Great epics, scriptures and Vedas. They appear to be fables outwardly, but inwardly they are pregnant with subtle meanings. They lay down the entire theory/science and philosophy of how to live our lives. Just surface reading is not enough. One has to practice what one has learnt. By practicing the wisdom we have learnt, the inner voice would guide us to practically implement the knowledge, thus alerting us all the time to exercise our mind – actions in the right direction. That is why one resorts to practice of techniques of Yoga, reading philosophical works, and other holistic treatments for permanent solace and comfort – these treatments do not limit to physical level but reach beyond. The main logic involved in these above mentioned treatments is uniting or syncing Body, Mind and Soul. Union of Body mind and Soul results in “Yoga” – total all round permanent health; disintegration of body, mind and Soul results in “Roga” – ill health or diseases. The very essence of Kriya Yoga is portrayed through this scene or picture. “Kri” means Action and “Ya” means Soul. When we practice Kriya Yoga, the Soul awakens and cultures the mind, thus training the senses to be alert and focused. Action guided by the soul is always correct. Perception beyond senses awakens the Soul which reveals the subtle connection.